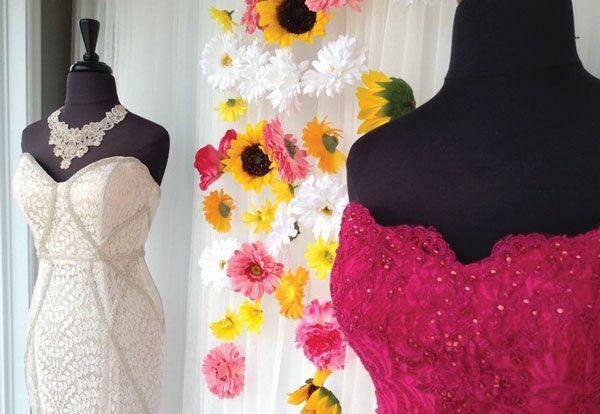 Knowing that many prom girls purchase based on brand names, An Affair to Remember in Fayetteville, N.C. highlights some of its most popular designers in display windows to capture attention. Blush Bridal and Formal in Bangor, Maine, focuses on incorporating playful props to create stories in window displays. Recently to kick off summer, the store cut up a pool noodle to create popsicles and ice cream cones. 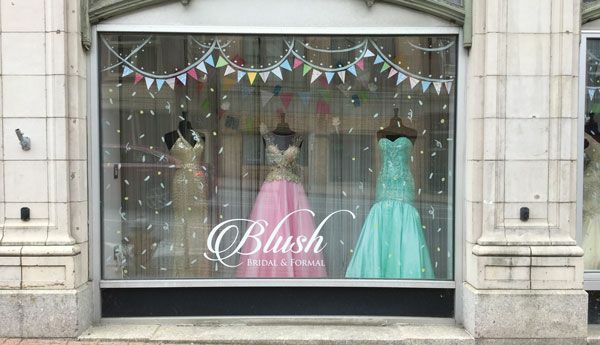 Blush Bridal and Formal in Bangor, Maine, displays all prom dresses in one room. 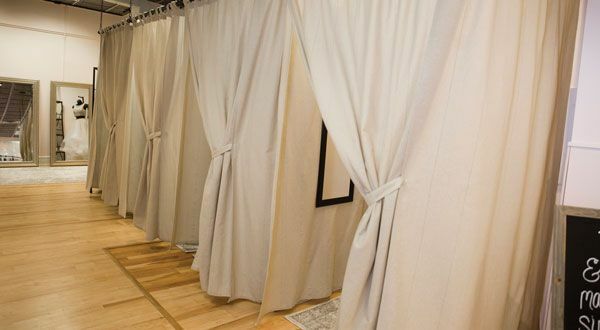 Fitting rooms for prom customers at Blush Bridal and Formal in Bangor, Maine. Winter window display at Pancsofar’s By Blush in Presque Isle, Maine. Spring window display at Pancsofar’s By Blush in Presque Isle, Maine. Apropos in Albany, N.Y. displays shoes and accessories prominently so that sales associates can style customers with shoes and jewelry. Your prom category is very unique from bridal. Not only are the target customers a different age group and maturity level but the actual garments themselves are brighter, more sparkly and often take up more space in your store. Creating a merchandising plan that is specific to prom will help you be successful in this category. VOWS asked veteran retailers with booming prom businesses to share five simple ways to be sure your prom displays are working in your favor. 1. Create a plan that matches your customers. 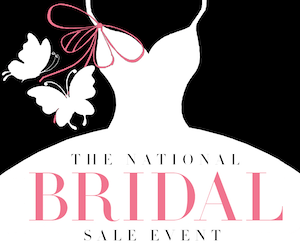 By now, you’ve noticed that your average prom customer differs vastly from the brides who visit your shop. For many, like Kathy Jensen, owner of An Affair to Remember in Fayetteville, N.C., prom customers don’t have time to place orders for a dress and they frequently don’t make appointments. Therefore she must stock more dresses for prom than bridal, and display as many as she can on the sales floor so customers find what they are looking for quickly. Last year Jensen sold around 1,200 prom dresses to local high school students. 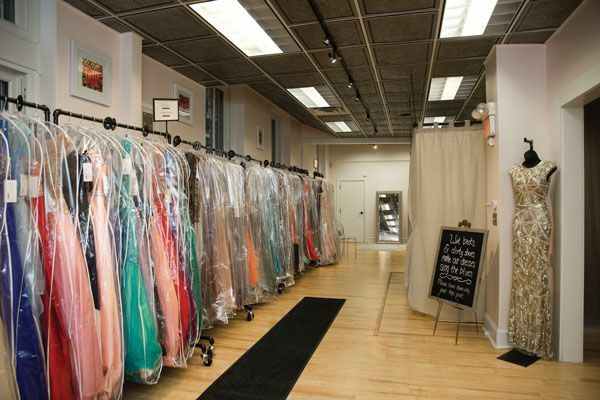 While her store is relatively small, she dedicated more than 2,500 square feet to prom alone. Dresses at An Affair to Remember are arranged by designer, and then by size and color. Jensen says that girls this age make purchases based on designer and brand names. They spend their time online, looking up designers through Facebook and Pinterest, and have a good idea of what they want when they enter her store. This sentiment rings true at Apropos in Albany, N.Y., where owner Sindi Saita groups her styles by color and trend, as well as by designer. Saita has dedicated 3,500 square feet of retail space to prom merchandise and keeps the category separate from bridal. Saita utilizes large posters and banners from the manufacturers to help customers identify with the images they have been searching online at home. On the other hand, the bridal section at Apropos is simple, styled with only a few mannequins. 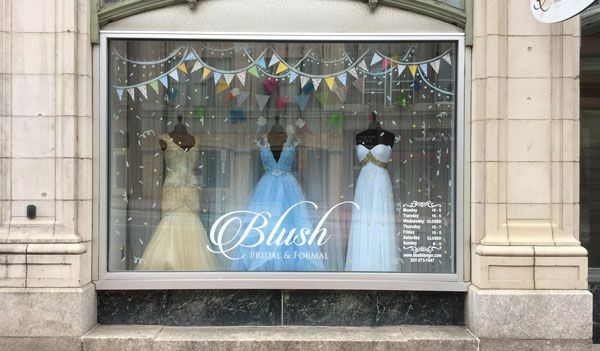 Blush Bridal and Formal in Bangor, Maine, initially organized all of their prom dresses by silhouette just like they did in bridal, but recently incorporated them all together. Once Mantz mixed the shapes together more silhouettes were being taken to the fitting room and purchased. 2. Create fun feature displays. Keep your prom displays fun, playful and trendy so young shoppers can easily relate. The Wedding Tree in Lacrosse, Wis., did just that by installing a long runway in the center of their prom section. This interactive display allows customers to see their dresses in motion under lights that mimic those at The Grand March. Not only does this display make the dress shopping experience easier for the customer, but it also helps the store build its sales. 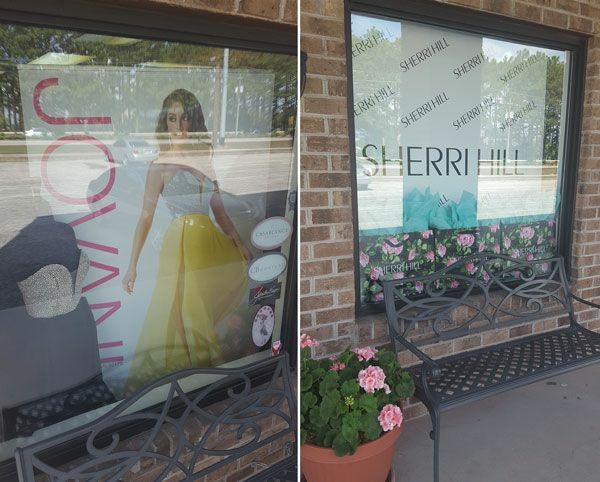 Blush Bridal and Formal uses feature displays to showcase the variety of styles and designers they carry in store. Mantz dresses a cluster of mannequins near the entry way in dresses that show off the current trends, but are not the most popular sellers. “Those are tried on so frequently that we can’t use them in our displays,” she says. But they do show off current trends – like two pieces, gold sequins and rose gold – so customers know right away they can find what they are looking for. The Wedding Tree rents tuxedos as well and incorporates these into their feature displays in the prom section. Pesch will work in matching vests and bowties, and changes the looks out every week so that girls can easily visualize their entire look on prom day. Jensen also incorporates tuxedos into her prom displays. “Once they get the dress they say, ‘What is my date going to wear? They always want him to match,” she says. At An Affair to Remember, customers typically buy directly off the rack so Jensen keeps each dress in a protective clear plastic garment bag to avoid damage that may occur as customers browse. This makes seeing some of the dresses hard so Jensen focuses on creating rotating feature displays within her store to better highlight the styles. Most customers already know what they want when they come in for their dress so it can be hard to steer them toward a different style. Jensen says styling mannequins and paring them with posters and backdrops provided by the manufacturers helps customers better envision styles they may not have considered. 3. Highlight your accessories. Feature displays that incorporate jewelry and make it accessible to customers streamlines the shopping process and contributes to add-on sales. Mantz feels that it’s important to allow customers to try on the jewelry with their dresses during the initial fittings so they can see the overall look. As such, she displays jewelry on shelves in the prom section so it is easy for associates to pull and help style customers. Necklaces and bracelets are held on jewelry display holders while earrings are kept on cardstock backers with the Blush logo on them. “Statement earrings and bracelets were big this year,” she says. The Wedding Tree has built a “Glam Station” that features a jewelry wall with mirrors and the same lighting that’s used on the runway so customers can see how jewelry will shine on prom night. 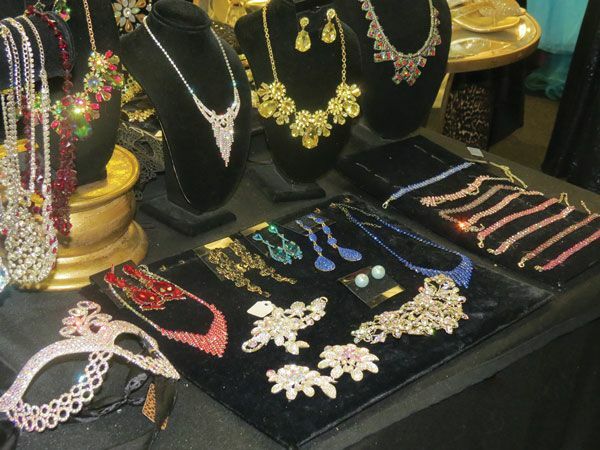 Jensen incorporates jewelry and accessories into her displays, being sure to style each mannequin with a statement-coordinating necklace or shoes. 4. 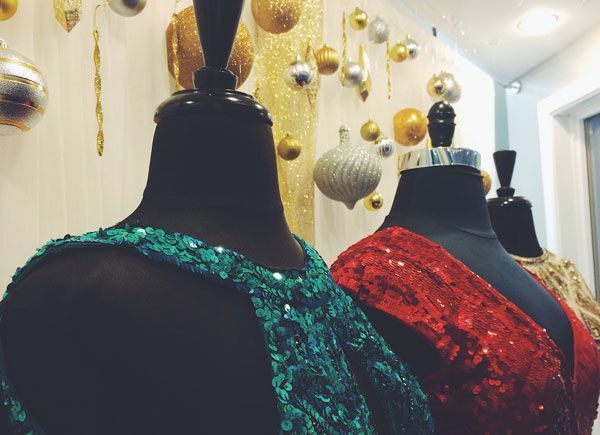 Make your window displays stand out. One of Jensen’s store’s biggest assets is that her second floor is made up of large windows. For example, after the attack in Paris last winter she dressed the mannequins in the colors of the French flag and added blue and red lighting. For Memorial Day she dressed the mannequins in red, white and blue gowns, and when a local high school won the state softball championship she created a display in their school colors. Mantz focuses on incorporating playful props to create a story around the merchandise. This spring Mantz decorated the window with umbrellas and raindrops for an “April Showers” theme. To depict the “May Flowers” portion of the window she attached long strands of yellow ribbon to a paper plate to make hoop shapes, and stapled fabric flowers onto the ribbons. And to kick off summer Mantz cut up a pool noodle to create popsicles and ice cream cones. 5. Don’t overlook social media. Thanks to Facebook, Twitter, et al., your displays can also help with your online marketing. High school girls are constantly using their cell phones to take selfies and share them with friends. All the selfies that get taken on the runway at The Wedding Tree typically end up online, posted to social-media sites like Facebook and Instagram. “We have our logo on the bottom left-hand corner of the mirror so when they are sharing their pictures, and when they are brides themselves, they remember us,” Pesch says. Similarly, Saita has hung a step and repeat in her front window that features the logos of a popular vendor as well as her own. She says this draws the attention of high school age shoppers and their images are frequently shared through social media. At Pancsofar’s By Blush in Presque Isle, Maine, customers who purchase their prom dress at the store are photographed with a sign that reads, “Best Dressed by Pancsofar’s Bridal Boutique.” Manager Amber Hews posts the image to the store’s Facebook page, and she also takes a photo with the customer’s phone. The sign also includes the hashtag #pancsofarsprom, which directly links those who search it to images of their latest prom styles and shots of their customers on prom day. Hews says a lot of the store’s success is due in part to social media.